It took a few years of denials and rumors but Microsoft Office for iPad is officially available. The company debuted the software for free on the iTunes App Store(s aapl) on Thursday with the news coming from Microsoft CEO Satya Nadella in his first public appearance as the company’s leader. The free version allows for viewing Word documents, Excel spreadsheets and PowerPoint presentations; file creation and editing capabilities will cost you in the form of a Microsoft(s msft) subscription plan. I haven’t installed the software yet on my iPad. I did check out some of the early reviews and images, however. The software looks visually excellent and feature filled; it should since the app was built from the ground up and not just a simple port of Microsoft Office for iPhone, noted Ina Fried from Re/code. So with a subscription plan and support on one of the best-selling tablets, Microsoft has a winning formula, right? There’s definitely some upside for Microsoft here, but I’d argue that it’s pretty limited. Had Office for iPad come to market two years ago, I’d be more optimistic. But since the iPad debut in 2010, a plethora of productivity suites launched for Apple’s tablet. There’s Apple’s own iWorks suite, which went free for all new devices purchased since September, and has only improved since the iPad launch. Days after I got my first iPad that year, I found Office 2 Pro, which later became Office 2 HD and is now Citrix ShareFile QuickEdit; the software works with Google Docs and has advanced functionality that may rival Microsoft’s own software. Add in QuickOffice HD, Dataviz Documents to Go or any other similar product and you can see it’s a crowded market now. Interestingly all of the rival products have a bit more flexibility when it comes to data storage. 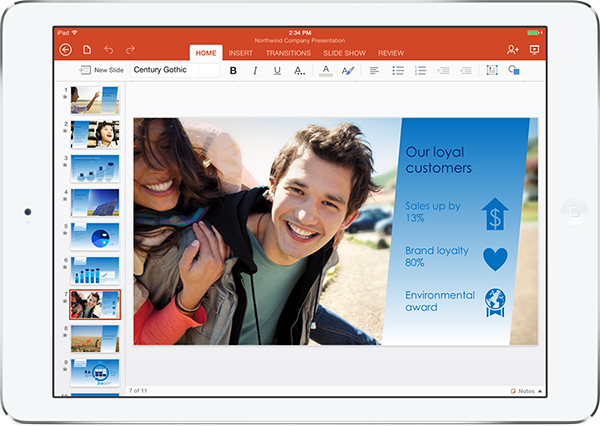 Microsoft’s Office for iPad works with OneDrive, formerly known as SkyDrive, and SharePoint. Look at the other products and you’ll typically see far more choices for document storage and sharing such as iCloud, Dropbox, Google Drive(s goog), Box, SugarSync and so on. Will many iPad owners want to have their document storage locked to a Microsoft server? I’m skeptical that many will. Most of these products support printing too; that’s a feature surprisingly not yet available in Office for iPad. Some Apple iPad owners who are already Office customers likely already subscribe to Office 365 so getting Office on their iPad is nice a bonus. But it doesn’t put any more money in Microsoft’s bank account: There’s five computer limit on the $9.95 monthly ($99.95 yearly) Office 365 subscription and it works with five tablets as well. Microsoft doesn’t get anything from these people, then. So that means the company is hoping to gain new Office 365 subscribers. That’s a great idea but Office for iPad has to be tremendously better than the incumbent alternatives — that may have already been purchased, mind you — to justify a new monthly subscription. For some, I’m sure it will. But for most iPad owners? I’m doubtful. The irony here is that Microsoft’s own tablet, the Surface 2, has now lost one of its key advantages: Office exclusivity. With Office for iPad available, one of the more compelling sales points to buy a Surface 2 is now a moot point. And to be honest, I’m not sure the Office exclusive really helped Surface tablet sales to begin with; there’s certainly no evidence suggesting it. So again, what does Microsoft gain? In this particular aspect, it may actually lose more than it benefits as there’s one less reason to buy a Microsoft Surface 2. Ironically, this all follows just a day after Microsoft pointed out three business benefits of its tablet that actually apply to Google’s Chromebooks as well. Perhaps Office isn’t all it’s cracked up to be these days; had Microsoft delivered the product sooner, it might have reaped far bigger benefits. Or maybe I’m just missing the magical powers of Office for iPad. Chime in and comment to let me know if you’re planning to pay up and use Office on your iPad. Kevin I am usually right with you – particularly regarding stylus computing, but not so with this. First it’s a turf war, Apple, Google and now Microsoft are stretching across the cloud gap. To do that you have to be willing to make a deal and Microsoft has certainly done that with their free version. The student edition is less than $80 for four years! Second, Office 365 is great. It first stumbling steps are over and it now does 99% of what people want to do and it does it well. I don’t know about you but at less than $10 a month, 5 installations is fantastic compared to buying Office 14 or whatever every two to three years. It’s always updated, it really works, and it’s weirdly attractive to me. 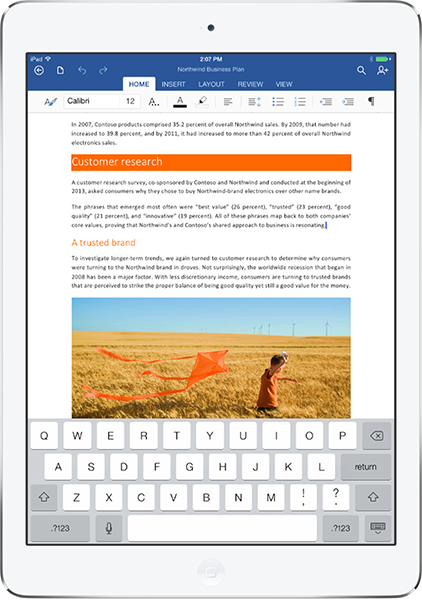 Last, I think Microsoft Office for the iPad will do really well in all tablet ecosystems. Even if you like the iPad world and the free Apple apps almost all of us need to communicate with others and 99% of the others are running Microsoft Office. I have been using OfficeSuite Mobile 7 which is a fantastic Android app but even I have been seduced by the single Microsoft interface and apps. I doubt that Microsoft targets new customers and more revenue. It looks like it protects their user base eliminating yet another reason to dump Office first and Microsoft second. Microsoft needs time to fix their Windows 8 errors and such offerings buy them that time. The best part about a tablet is the portability. Being on the road a lot, I’ve found that I can’t assume that I’ll have connectivity. I absolutely need a copy of the file on the tablet. So files locked into the cloud just won’t work. I’ve managed quiet well without MS on my tablet. Why would I start now? PS I’m one of those so called inflexible + Gen-Xers. The general comments about our cohort behavior is uninformed. I disagree that the Microsoft Surface has lost one of it’s key advantages , by having an Office exclusive. The reason being, the ability to operate office in one window and AT THE SAME TIME, browse the web and fact check or do email etc. You will still be able to be much more productive with the Surface. This move by Microsoft will only reinforce the message of what it is that you really want to do. Thanks Kevin, for helpful info and insights. This move does help MSFT a lot, but it is defensive. it’s about preventing further erosion as BYOD and Cloud force Enterprise IT to give up on its prior Windows-only support model. And yes, it’s two years late. They key problem – keeping Balmer too long. Well put, Kevin. Especially your point about the target audience, and Surface not being very successful, despite the “it runs Office” pitch. I think Microsoft are Wiley over estimating the value of Office on the iPad. If they were serious about clawing back lost ground from Apple they would make it free. I certainly won’t be buying it although I use office on my Mac. Thank you for a helpful article which I enjoyed reading. If anything Microsoft’s release of Office for iOS for free while tying it into Office 365 subscription is as a result of Apple’s excise taxes for App makers to be part of the iOS environment. Why would anyone with a real App, with a real price point give up 30% of their revenue from sales to Apple as a requirement to have it available on the iTunes store. That is the only way to get iOS Apps unless you have a corporate license for private iOS app access. That would be just crazy loss of revenue unless they priced things 30% more for iOS users to make up for what Apple takes. Guess Microsoft has found a way around that revenue grab with the subscription model for their services. Actually, Microsoft hasn’t found a way around that. If you buy the Office 365 subscription in Office for iPad, Apple does get 30% of the $99 fee. It’s an in-app purchase. That’s for new customers that are aquired via app store, right? If someone subscribes to Office365 directly with Microsoft, Apple would not have any cut of that revenue. The iPad app is merely a client front-end terminal to the Office365 cloud. Similar to the Kindle app. It would be interesting to know more about the negotiation between Microsoft and Apple on this issue, e.g. did Microsoft want to take the Amazon approach and remove in-app purchasing? Correct, Apple’s cut is solely from the folks that buy the subscription through the app on iPad. I don’t think most folks will do that as noted in the article; I anticipate far more folks who are already Office 365 subscribers will simply add the iPad to their account, in which case, Apple gets nothing nor does Microsoft; it already took in the subscription revenue. In my previous post there was as iPad auto-complete induced typo, it should read “in the cloud” not “I’m the cloud”. Kevin, agreed – it is too constraining that one must use Onedrive, and there are no other options. Seriously, whatever happened to the great idea of using WebDAV for cloud storage? Some people in business prefer run their own servers, or virtual machines (IaaS) I’m the cloud – both approaches can be used for configuring WenDAV realms with a good old web server such as Apache. There seems to be in recent times a proprietary cloud frenzy. Give me LAMP with WebDAV and IaaS any day! Largely disagree with your valuation assessment here. If the market consisted entirely on millennials, yes competing products, extra cost, yada, yada, yada… but purely from a dollars and cents perspective, the largest wage-earners are de-facto locked in to Office because of their aversion to change and new product adoption; they learned Office in the workplace and they’re not interested in learning something new. Sure, we can recognize that same program on new platform is intrinsically new, but Brand is still king here so yes, this release will drive 365 subscriptions at least in gen-X and above (who are just now catching on to 365 as a product in the first place). More imporatantly though, this release is about mindshare both for the Microsoft brand and for the new hardware strategy. First and foremost, it’s Satya’s signal to the world that Microsoft is indeed committed to being a modern player. In light of Windows Phone sales, Surface sales, Windows 8 customer perceptions, etc., M$ has earned a rep as the 90s powerhouse chasing the modern market and never quite understanding it. Office for iPad doesn’t validate them as a current player but it’s the ante that gets them back in the game. It confirms they’re committed to being in any market space/environment; even a competitor’s. That said, it finally allows the Surface to be evaluated on its own merits. Holding the market hostage with hardware exclusivity doesn’t get mainstream buyers… it just gets them angry that they’re being held back from feature parity because the vendor doesn’t want to play ball. Giving buyers the closest thing to feature parity in the software is the best way for buyers to realize how epically bad the iPad is at content creation. Now that can’t cry that the reason they can’t work on the iPad is because Microsoft won’t make a compatible version of Office. Even the best software and the best keyboard in the world makes it a substandard production platform if for no other reason than the lack of a pixel perfect pointing device to get your little cursor in between those two blasted little charaters; and no the finger magnifying glass is NOT sufficient. Granted the MS developerscape is stupendously lacking in even the most common of apps and the “is RT a thing or is it dead” question will keep it that way until developers get a clear answer on how Microsoft will sell sub $500 devices, but still, when dude with a Surface sits next to dude with an iPad now at work, they’ll look at eachother banging out a document in their company’s shiny new 365 cloud environment and see the Surface run circles around the iPad. Sadly, ironically, it’s the only relevant tablet for mass market thought product creation. It’s not ready to be adopted en masse yet, but make no mistake, Surface took a big step closer to the spotlight today, not away from it. This is what happens when the tail tries to wag the dog. Don’t forget that Office on Surface 2 still has the benefit of allowing full document editing and creation, so I wouldn’t write that device off just yet. I also don’t think anybody was seriously expecting the iPad version to match functionality with Office on the desktop. Then there’s the argument for the Surface Pro 2, which lets you get into other Office software such as Publisher. Surface is the only slate to offer native 4-way keyboard/mouse/pen/touch input – important for productivity. It’s also the best device to use for OneNote.